The rationale for this article is to awaken an interest in the beautiful structure and form of brush lettering, leading to well understood and carefully constructed letter carving through looking, understanding and admiring. Many books have been published concerning the mathematical construction of letters, I though prefer the interpretation of Edward Catich in his book The Origin of the Serif where he advocates the use of a chisel ended paintbrush, held at a slanting angle. The Romans it is believed, often painted directly onto stone when carving letters. With approximately 659 mediaeval churches in Norfolk and the magnificent cathedral in Norwich, one is spoilt for choice with carving examples of the highest quality. Everywhere we are overwhelmed by the wonderful workmanship of past carvers and sculptors - we just need to look. 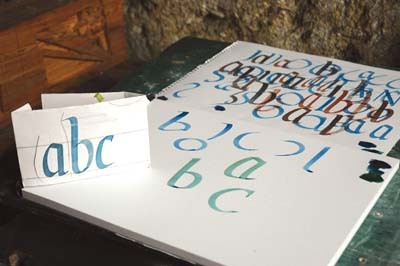 It is tempting to just point the camera and click away, however my aim is to show that by using a sketchbook and pencil, a deeper understanding of the 26 letters of the alphabet can be achieved. Mix up the paint to a creamy consistency, load up the brush and dab it onto the paper - this will achieve a sharp edge on the brush. Hold the brush upright between the thumb and fingers, just above the metal ferrule, with the outside edge of the hand resting on the paper. Don't grip too tightly. Try and feel the weight of the brush and then practise stroke making. 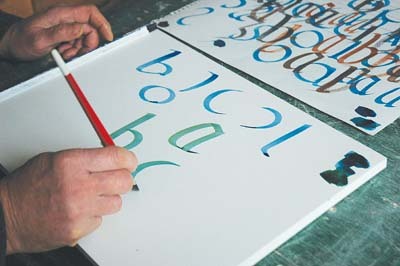 To save paper, change the colour of the paint so you can see immediately which strokes work best. 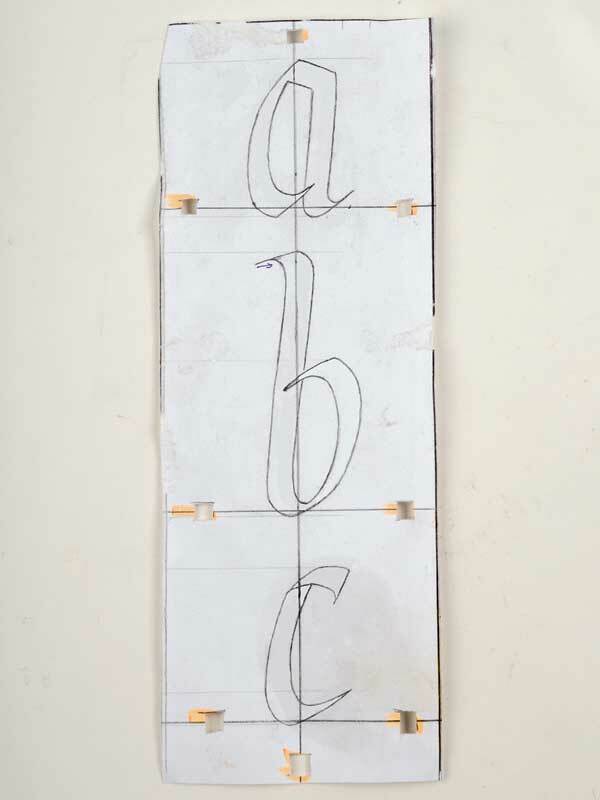 Once you are happy with your method, paint onto paper your A, B, C and fix these brushed letters to your drawing board with masking tape. Next, underline them and make sure they are squared up on the paper. 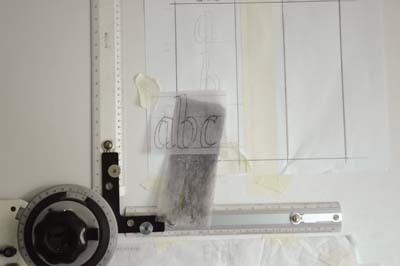 Trace over your letters using the HP pencil and lining paper. 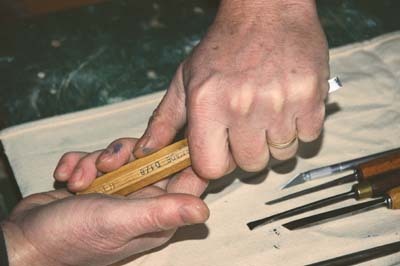 Note - pencils are as important a tool as any gouge and need to be sharpened correctly. I use a Staedtler Mars HB pencil, sharpened to a long point with a knife or scalpel. 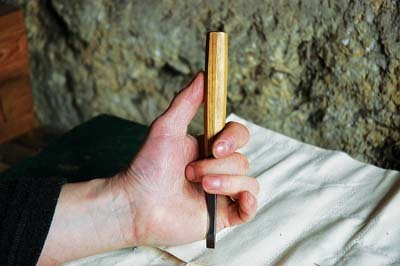 The lead of the pencil is then rolled on a piece of fine glass paper to achieve an even finer point. 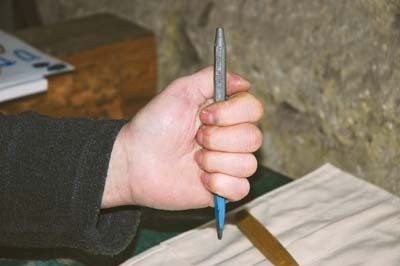 The pencil point is then fine-tuned further, by lightly rubbing and turning the lead, onto the piece of lining paper used for tracing. When the pencil is sharpened correctly, place lining or tracing paper over the brush letters and draw around the outline of the letter. Fix the lining paper over the top and carefully draw round the letters. It is vital to remember that at all stages of line drawing, the current one must improve upon the previous, and of course it is easier and less costly to make the decisions at this stage rather than later. Next, using the carbon paper, trace the letters onto a clean sheet of paper and redraw carefully. I have drawn 2 columns on my sheet of paper to represent the wood and stone blocks. Using a strip of paper, mark the stroke widths of the letters, the widest point, and the upward stroke. Check all the letters and adjust them to these marks. 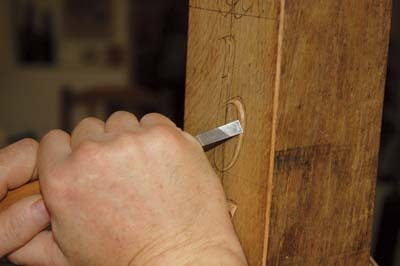 Using a marking gauge with a pencil attachment, mark the horizontal and vertical centrelines onto your wood or stone - these are independent of the line drawing. 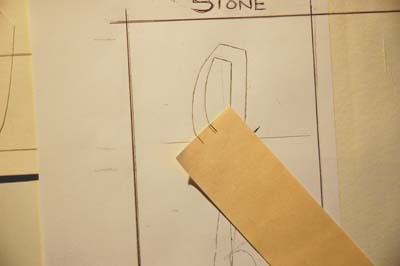 Cut out sections of the centrelines on the drawing and then place the drawing onto the wood or stone in such a position as to line up with the centrelines showing through. Now pounce (trace) the letters onto the wood or stone. Carefully redraw the letters again, always looking at the original brushed letters so as not to miss any nuances or detail. 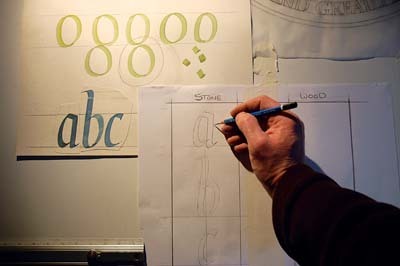 At this stage I would draw in the centreline of the letter - this is a very important line and should always be in the middle at all points of the letter. Note - a V-cut letter is constructed by changes of plane and only seen by the shadows formed when light hits it. It is different to a line drawing, which is an interpretation of this. 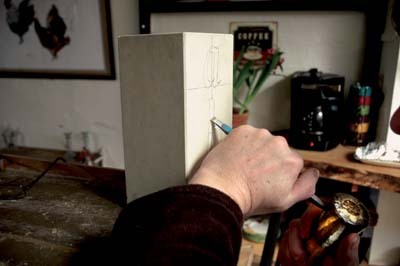 I now tend to use an upright carving stand as used by most stone carvers, even when carving letters in wood. This is a personal choice which I occasionally intersperse with using the bench. Being able to carve right- and left-handed is an advantage. Being naturally left-handed when I first learned to carve, I started using my right hand - this means the work doesn't have to be turned so often and carving in some awkward positions can be avoided. Starting with a chisel, this hand is effectively the brake, stopping loss of control. Image 8 shows the hands working in unison. A tight grip and white knuckles are not required - eye coordination and hand control is what is essential here. 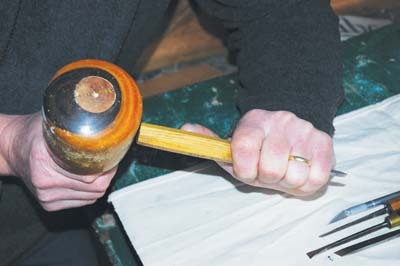 Image 9 shows the use of the mallet, and image 10 shows the different grip used on a tungsten carbide stone carving chisel. 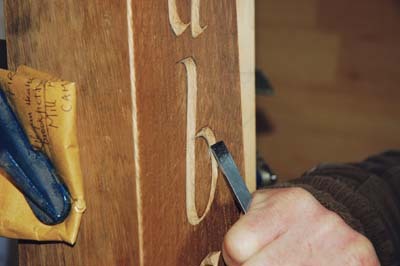 Fix the wood firmly to the stand and using a V-tool, carefully cut the centreline of the letter. Always start cutting from the narrowest point of the letter leading into wider parts - be aware of the grain and cut cleanly. This is only a starting technique, so don't try and cut to the lines of the letter. It goes without saying that all chisels and gouges need to be razor sharp and periodically honed when needed. 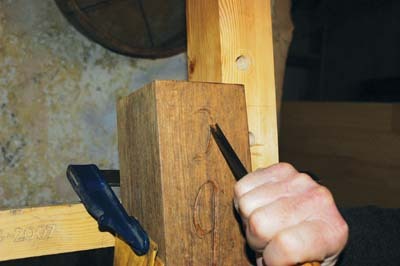 I have tended to develop the technique shown to me by David Holgate of extending the V-cut using the firmer chisel and skew chisel as a chasing technique. The point of the skew can be used in delicate work and for getting into corners, even occasionally used for shaping. 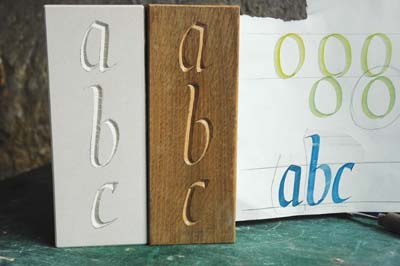 For curved letter shapes, I carefully cut in using other shaped gouges - I have a very good selection in my tool roll, which are mostly Victorian. When carving a large number of letters the temptation is to cut over all of them, using one gouge at a time, but I discipline myself to start and finish one letter at a time. 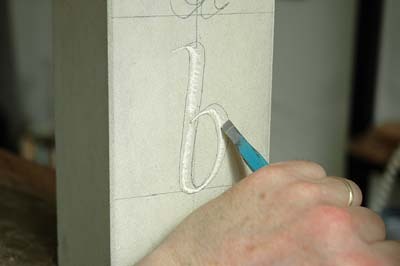 When all the letters have been carved, lightly sand over and remove the pencil marks. Have a coffee break and then return to the letters, making sure you have a good look- first impressions are important so trust your eyes. Then with the original painted brushed letters next to the woodcarving, carefully redraw them. Again, check for width sizes using the strip of paper with the marks. Don't be afraid to ask for other opinions - we all have the ability to see faulty lettering. Then do the final cut over and finish. 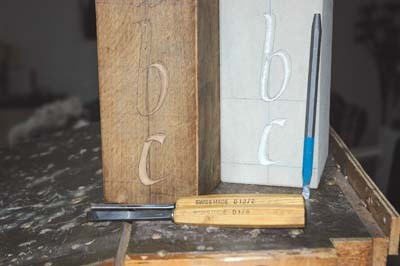 We now turn our attention to carving the letters onto our Portland stone block. The wider part of the letter, as you would expect, is deeper than the narrowest part of the letter, with a varying slope in between - this is also the case of course with the stone carved lettering. Until now all stages have been identical in reaching this point. 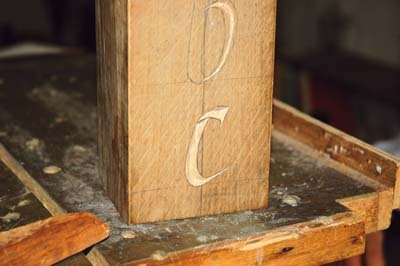 Again, starting at the narrowest point of the letter, a centreline is chased out using the corner point of the chisel. 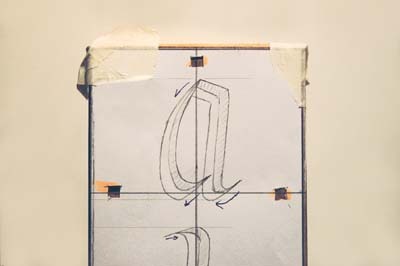 If the letter goes from narrow to wide and narrow again, then start at either end and work towards the middle. The stone is chopped away in a series of very small steps - these can be seen on the photographs as a series of lines running up the letter at 90 degrees to the outside and inside line. Image 18 shows the wood and stone block at similar stages. The initial scratch is broadened out into a V-cut which extends to the outside lines of the letter - try and keep within the outside edge of the pencil line. 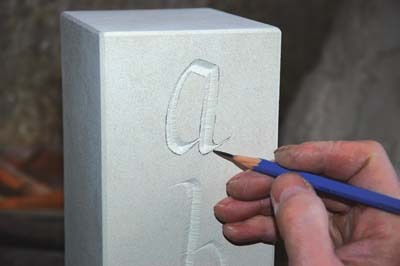 As with the woodcarving, lightly sand the stone with wet and dry paper and redraw the letters. Then do the final cut over and finish. Image 20 shows the wood and stone block finished side-by-side. It will most likely seem a very slow, painful and frustrating progress at first, but stick with it because with each improvement in your work will come a sense of great satisfaction. 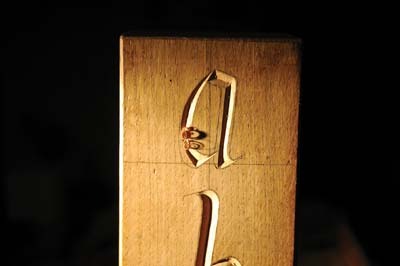 And although we have concentrated here on the first three letters of the alphabet - a, b, c - the techniques used to carve these can be applied to the remaining 23 letters.